Last year, I interviewed Cory Lee, a wheelchair bound traveler, about his experience seeing the world. 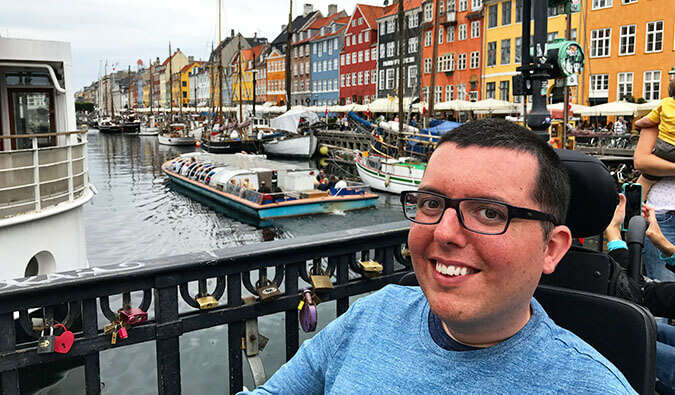 I’m a firm believer that travel is possible for people from all walks of life, so when I stumbled across Cory’s website, I knew I wanted to share his inspirational story. You don’t meet a lot of disabled travelers on the road. Matt: Tell everyone about yourself. Jim: I am a fifth-generation Florida native, dating back to 1828, when Florida was a territory. I grew up in West Palm Beach, leaving at age 19 to join the military. I served as a soldier in the US Army for slightly over 30 years of active duty service. I consider my time in the military as one of the best things that ever happened in my life because of the experience, training, opportunities, and development I got. I retired from active duty in 2002 and immediately after, I secured employment as a civilian with the US Army Training and Doctrine Command at beautiful Fort Monroe, Virginia. I recently turned 64 and plan to work in my current position until age 66. You’ve been in a wheelchair for a year. What happened? I have been in a wheelchair since December 2014. I have an unusual autoimmune disease called inclusion body myositis (IBM); it’s the result of an overactive immune system, where white cells attack good cells, inflaming and gradually destroying muscle tissue, resulting in loss of muscle mass and severe weakness. I have always been very active and had anticipated I would remain physically active in my old age. But now I can do very little for myself, although I certainly do what I am capable of. I cannot dress myself, put on my socks or pants, or button my shirts. I can rise to my feet under certain conditions, meaning from a certain height using a motorized office chair or lift recliner. I am very unstable when standing but can use a walker on smooth, flat surfaces indoors. But I have gotten to the point that this is not safe or even possible outdoors. Were you a big traveler before you started using a wheelchair? I have always enjoyed traveling and was provided many opportunities to travel as I relocated to new duty stations. For example, in 1985 I was stationed at Fort McClellan, Alabama, and relocated to Fort Greely, Alaska; we chose to drive from Alabama to Alaska. It was very interesting to drive across the country, through Canada, the Yukon Territory, and the Northwest Territory and back into the USA. Two years later we made the drive back to Fort Pickett, Virginia. A few years later we drove from Virginia to another assignment at Fort Bliss, Texas, and then back to Fort Bragg, North Carolina. In my current job I traveled about one week each month using air and ground travel. Many times I was working, but I also tried to make every business trip a fun trip by planning ahead and researching opportunities I could take full advantage of. One of my favorite locations for such required travel is San Antonio: I know when I go there I’ll go to the Riverwalk and the Alamo and enjoy authentic Mexican food, the best Texas barbecue, and steaks. These are simple things, but ones I truly appreciate and enjoy. When you ended up in a wheelchair, what did you think travel would be like now? Did you think it would be possible? My move into a wheelchair has been a gradual process that allowed time to think ahead, research, and plan how to overcome new obstacles. I know that travel will continue to be difficult and challenging. I also know that planning well in advance will allow me to resolve problems and better enjoy my travel. I feel that I have a choice to travel or not travel. But not to travel implies defeat, and that’s not a good choice for any of us. The time may come that travel is no longer possible, but I do not plan to rush into defeat. This will be a time of resolve and determination to make the best of the life given to me. How did you overcome any obstacles? My most recent travel objective was to drive the entire length of the Blue Ridge Parkway, which is 469 miles from Rockfish Gap, Virginia, to Cherokee, North Carolina. Preparation for the trip included a detailed written plan depicting each day’s starting point, destination, projected travel miles, dining suggestions, and lodging location (it is imperative that I find handicapped-accessible lodging that includes a roll-in shower, as I am unable to step over a bathtub). A packing list has been a practice of mine for many years, and that makes packing and planning easier. Some of the unique items I pack are a hat with a mounted flashlight, a night-light for hotels, portable suction grab bars, a lift belt, a urine bottle, non-slip pads, a bath mat, wet wipes, a grab stick, and a raised toilet chair. Keeping these lists and adding to them from lessons learned during and after the trip is very helpful. What is the hardest part about traveling in a wheelchair? I’d say the hardest part of travel that I experience is all the unknowns. For example, arriving at a lodging location with a reservation for a handicapped-accessible room with a roll-in shower and then finding that it has a tub. I learned it is best to make a reservation for a roll-in, call and speak directly with the hotel manager, and then call again the day before arrival. That’s a lot of calls, but this is important to me. I prefer the Hampton Inn Honors program, which clearly describes their rooms and accessibility. I am also a Marriott member, but their online site has not been very user-friendly locating handicapped-accessible rooms. What are some good resources people in wheelchairs can use to travel? I suspect many just think they can’t do it! I am still learning about resources for travel, but I have found it is good to ask others specific questions about their travel experiences. The Internet is an excellent source of information; you can ask most any question, and someone will point you in the right direction. For example, I really had no idea there was a wheelchair capable of rising straight up, which is what I needed. The VA (Veterans Administration) representative immediately recognized my needs and provided the perfect chair for me, for which I am very grateful. Don’t give up, be determined, research, and ask others for advice and suggestions. What’s the greatest lesson you’ve learned from this? I don’t have life as tough as many others. When I start to feel bad, angry, or frustrated for what I am going through, I snap out of it immediately, realizing there are so many others that experience much worse circumstances and difficulties. There are techniques, equipment, and sources of information readily available that allow those of us with disabilities to continue to enjoy many pleasures of life. How we conduct ourselves routinely affects others. We may not realize how others observe from a distance those of us with disabilities and how we continue with our daily activities. Many have told me that they have watched me several times and how I conducted myself. Unknown to me, my actions and kindness motivated them to have a more productive and pleasurable day. It’s important to remain positive and display an enthusiastic attitude of friendliness and happiness. Be friendly, stay positive, and find joy and contentment in your circumstances. My wife is my best friend that I can depend on forever. Cindy and I have been married for 34 years, and our goals have always been to outserve each other without keeping score. Having a loving and caring companion is an important and necessary part of my life. God designed us for companionship to serve one another and to share life’s experiences, particularly in health and sickness and for better or worse, as we said in our commitment of marriage. I have a job, friends, medical care, and more, but sadly, some do not have anyone. I am truly blessed and take none of this for granted. God has provided much more than I deserve. I pray that others will be able say to the same. 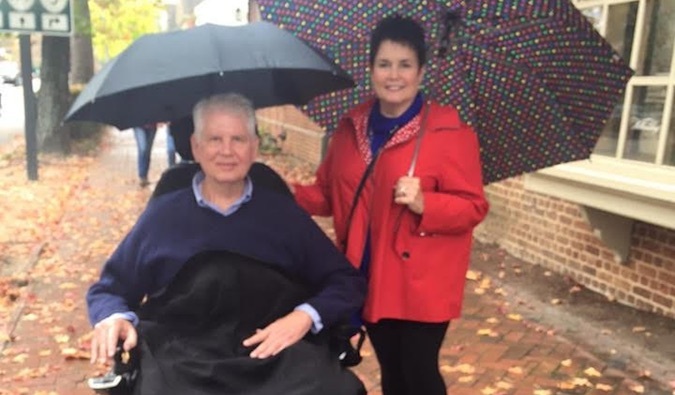 My purpose in sharing my experience as a man with disabilities and using a wheelchair is to encourage others, to find contentment in my circumstances, and to remain grateful every day. Those of us with disabilities have many challenges and difficulties ahead. I am a man of faith, and I give God all the glory as he created each one of us perfect. If you are reading this, I want you to be encouraged and to be encouraging. Do you plan to travel internationally, or is that a little too much right now? If so, how are you planning that? I do not plan to travel out of the country; I simply do not have that desire. I am confident that air travel is possible but would require considerable assistance. I often wonder how guys like Texas governor Abbott and Charles Krauthammer maintain their pace and travel. I believe if they can do it then so can I. We have to believe in ourselves and give it a sincere and wholehearted try. When you are traveling, how do you figure out what activities you can and can’t do? Do you use any special organizations? Part of my process for choosing a destination is to check out its website and verify with a phone call. Many websites specifically address accessibility. Not long ago I took my wife for dinner at the Williamsburg Lodge to celebrate our 34th anniversary. When I arrived I was surprised to see three steps going down into the dining room and the nearby elevator inoperable. No problem, though, as I had the pleasure of an escorted tour through the kitchen and down a ramp into the dining area. I like to use Armed Forces Vacation Club to receive discounted resort lodging, sometimes as low as $299 for seven days. Their options usually address accessibility but aren’t very clear on specifics, such as roll-in showers, but a phone call to the resort will answer most questions. I also use Vacation Rental by Owner. These accommodations are usually very specific and provide photos and have a search filter for wheelchair accessibility. If you could offer someone in a wheelchair or with another mobility disability three specific tips for travel, what would they be? 1. Veterans should check out the Veterans Affairs website to determine their benefits. If you are a veteran and need a wheelchair or modifications to a home or vehicle, the VA will assist. If your disability is service connected, then additional and increased benefits may be available. Make sure you contact a local Veterans Service Organization for their expert advice. 2. Plan thoroughly and well in advance to obtain and confirm lodging, accessibility, and available equipment. For example, while I was still on my feet and using a walker for short distances, I visited the Baseball Hall of Fame and Niagara Falls. Both facilities offered the use of a wheelchair. Keep your plan handy so that you can edit and improve it for your next trip. 3. Make a bucket list. Let planning and doing these things be a new hobby for you. If necessary, start small: go to the movies, go to the beach, attend church, work as long as you can and as long as you want. You will develop confidence in your abilities to travel, and then your bucket list can really grow. What trips do you have planned in the future? I have several trips planned for this year. They are all by ground transportation in our modified and accessible van. We also plan to drive old historic Highway 17 from Virginia to Florida and participate in the Azalea Festival in Wilmington, North Carolina. Driving Highway 17 is like taking a trip back in time, as many of the sites have not drastically changed. There are great places to eat at, locations that are a combination of restaurants and gas stations serving fried pork chops, collard greens, black-eyed peas, cornbread, and sweet tea. In the fall we will travel the Skyline Drive, which begins where the Blue Ridge Parkway ends in Rockfish Gap, Virginia; it’s fairly short drive north of about 109 miles of beautiful and scenic views. The goal will be to never drive on the interstate and remain on roads less traveled. People like Jim are an inspiration. They don’t let adversity get in their way. Like the saying goes, where there is a will, there is a way. 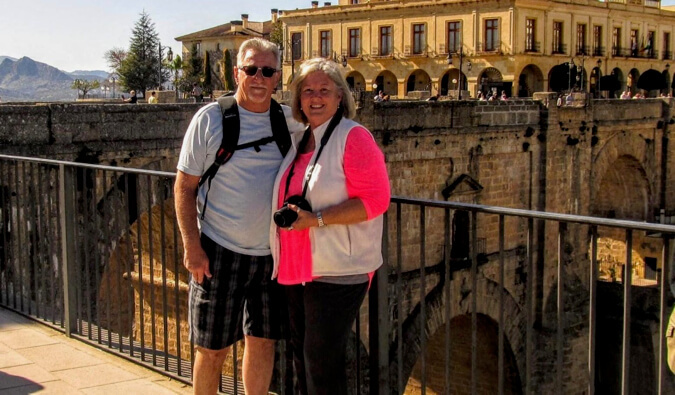 Jim uses careful planning, support groups, and the power of the Internet to let him fulfill his wanderlust. One of my favorite parts about this job is hearing people’s travel stories. They inspire me, but more importantly, they also inspire you. I travel a certain way but there are many ways to fund your trips and travel the world, and I hope these stories show you that there is more than one way to travel and that it’s within your grasp to reach your travel goals. You can send me an email at matt@nomadicmatt.com if you want to share your story! P.S. – Last week, we launched our travel writing and photography courses. If you’re looking to improve your writing or travel photography with detailed instruction from world class teachers, these two new affordable classes will help! 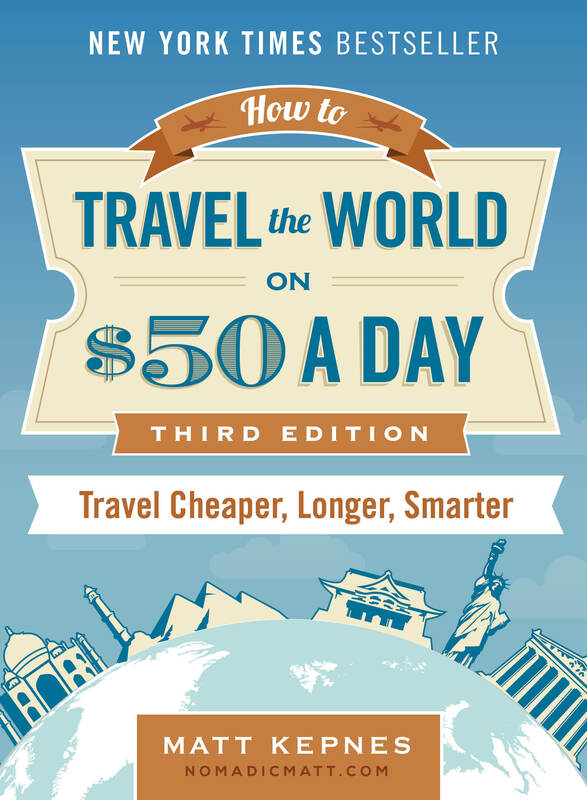 How Will Travels the World on $20 or Less Per Day! This is so inspiring. I loved how he wrote about his wife, really heartwarming! yeah I like that part of it too that I copied and paste it to my timeline for all others to be inspired! I’ve got a good friend with Cerebral Palsy who’s just made it to San Francisco and Bulgaria; and has taken to following a career in Stand Up Comedy following the empowerment travel gave him. Thanks for sharing this story! It strengthens our belief that though not everything is possible, but far more things are than we usually think. Very inspiring traveler! Wishing him the best for his future travels! Tourist destinations too have a responsibility of being disabled friendly. Great! You are a true inspiration for us! This story about Jim really touches my heart and it really inspires me. This is the true spirit of adventure! Reading this was truly inspirational. I’m mobility impaired in legs, arms, and hands after a spinal break and use either a walker or wheelchair to get around. I want to resume traveling but still hesitate. Do hotels have toilet risers in their handicapped rooms? Thank you so much for this post! I have multiple chronic illnesses that impair my mobility and cause intense pain and fatigue. I use a cane about 90% of the time. I’ve always loved to travel, and refuse to let my illnesses stop me. Hearing about other disabled travellers is so empowering. What an inspiring post! Thank you for sharing this story. Go Cory Lee! Please, could you use the phrase “wheelchair user” instead of “wheelchair bound”? People who use wheelchairs are not “bound” to them — which smacks of being imprisoned — they simply use them to get from point A to point B. It may seem like a small thing, but language is important. Thanks for your great blog, very inspiring. I am a fellow travel enthusiast from Australia who is blind and have learnt so much from you US expert bloggers. I just wish I could access all the easy point deals you get access to! I do love buying Aadvantage miles and flying first class though. with appropriate credit and link back of course? My disabled readers need to know more about what is possible and what others are doing. I know I enjoy travel with my wife even though I am blind. Hi Jim. & Matt. This is such an awesome and inspiring story. I too am a retired Army Veteran. I love to travel too, but I have multiple sclerosis ( that’s the reason why I had to retire from the Army), and sometimes it’s tough. I’m so glad to read that you are able to enjoy travel. When I found out I had MS, I was pretty upset too, but I’ve come to terms with it and found my passion teaching history. Matt, thanks for interviewing a military Veteran. P.S. I just moved to AZ from VA and have fond memories of the Rockfish Gap entrance to Shenandoah N.P. Great post from our wheelie friend. Go for it while you can. I remember once pushing my sister, in a wheelchair around a park in western Australia. It was a sealife path and it had an underwater display that went under the side of the tank where you could get a good view, not always possible in a wheelchair. A woman complained that we had been in there too long and would we mind moving! I was about to reply ok when her daughter, just a young thing , said to me, lady, you can stay in my spot because I can see from anywhere! I will always remember how kind people can be when they can see someone else has a bigger challenge. Respect to you for getting out there. Always take a hand when needed. Happy travels.